Hundreds of growers take to the fields in pilot program as legalization bill moves forward in U.S. Senate. WISCONSIN—The state’s first industrial hemp crop in over sixty years is now being planted by 227 farmers on about 2,200 acres. The plant is a cousin of marijuana and was listed as a Schedule 1 controlled substance in the 1960’s for the relationship, but today 40 states have either implemented a pilot program or have recently passed legislation to do so. The plant can be used in a variety of ways—optimists estimate over 25,000 applications—depending on its specific genetics and how it is processed. At the moment, the booming market is led by pharmaceutical initiatives with cannabidiol (CBD), an extract from the plant’s flower buds which has shown promising uses in medicine. The plant can also be harvested as a grain, like wheat, but does not produce gluten, making its use on the growing offerings of gluten-free products especially attractive. Accordingly, the state’s 88 licensed processors are either focused on CBD or grain purposes, but logistical headaches are tied to the crop given its federal illegality. Data from the Wisconsin Dept. of Agriculture, Trade, and Consumer Protection. 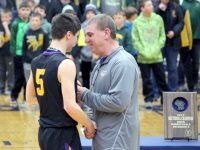 “This is so exciting for Wisconsin, because we’re leading the way in this new and emerging market,” Rob Richards, senior director of governmental relations for the Wisconsin Farm Bureau told The Denmark News. “The most common complaint that I’ve heard is that it is very difficult for anyone to secure lending from banks because of hemp being Schedule 1,” Richard said. Since banks are federally insured, they are barred from investing in a federally illegal product, even though the new industry is permissible under the 2014 Farm Bill. Kentucky Senator Mitch McConnell introduced a bill in April that would declassify hemp as marijuana and fully legalize the plant for agricultural use nationwide. It was included as an amendment to the Senate’s version of the 2018 Farm Bill, which succeeded in committee on a 20-1 vote and may see a full vote as early as next week. 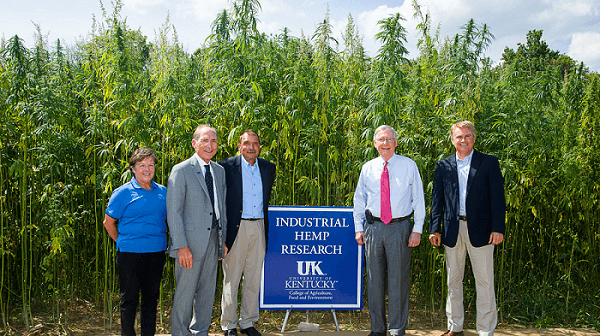 Kentucky Senator Mitch McConnell and Congressman Jamie Comer (right) with University of Kentucky College of Agriculture, Dean Nancy Cox, University of Kentucky President, Eli Capilouto and University of Kentucky Agronomist and Head of Hemp Pilot Program, Dr. David Williams. Senators Ron Johnson and Tammy Baldwin have both cosponsored McConnell’s bill, as have 26 of their bipartisan colleagues. Five of Wisconsin’s eight delegates in the House of Representatives have also cosponsored similar legislation introduced to that chamber in 2017, though neither the Energy and Commerce nor the Judiciary Committees have taken action. “Hemp plays an integral role in agriculture…Wisconsin’s 8th District relies on agriculture to create jobs, grow the economy, and feed its citizens. I am committed to helping all our farmers and the industry thrive, while still protecting the environment, animals, and our residents,” Rep. Mike Gallagher said in a statement on the topic. Gallagher also championed revisions to dairy risk protection policies which were included in the House’s version of a Farm Bill that passed by two votes on Thursday. The state of dairy in Wisconsin has been in flux for years as large industrial farms nationwide have increased production astronomically while demand has flat lined and certain outlets have closed, such as Canadian tariffs imposed on diafiltered milk last spring. Data from USDA National Agricultural Statistics Service. “Farmers in the 8th District and across the country have been suffering through the worst farm economy in over a decade, and have seen real farm income decline 52 percent in the last five years alone,” Gallagher said in a statement following Thursday’s vote. The stagnant dairy economy has been suspected as a driving factor for hemp’s popularity in Wisconsin, and for good reason. 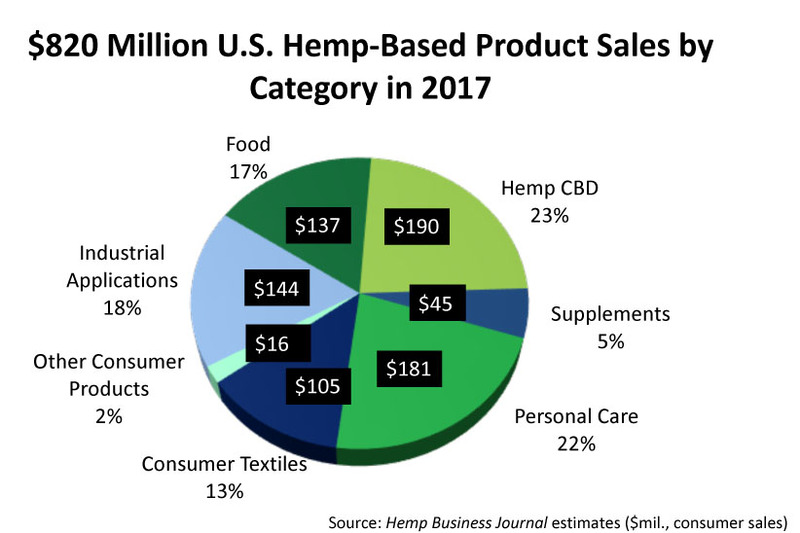 Last month, Hemp Business Journal reported that the United States hemp-related product market topped $800 million in 2017, nearly $200 million of that being CBD products. The report estimates a $2.5 billion market by 2022 which, on paper, seems more promising than playing the milk game, where prices have been low and immobile for nearly four years. “Farmers are entrepreneurs by nature and are always looking to diversify what they’re doing to find better chances of success,” Richard said of Wisconsin’s quick appetite. Though CBD and grain are the domineers of the state’s early infrastructure, several components of the Wisconsin economy—namely plastics and paper manufacturers—have new production options at their disposal. The implementation of processing infrastructure has not exactly been breakneck. “This is an emerging and developing market. 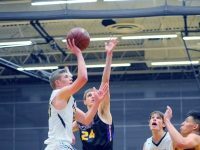 The investment and infrastructure is coming, but people are kind of holding back until the picture is a little bit more clear,” said Richard, citing fiber processors as currently being absent from Wisconsin. “In Brazil, there are spots where on the left you see the lush Amazon rainforest, and on the right it’s all flattened and destroyed,” said Perlowin, whose company opened a $20 million hemp fiber processing facility in Spring Hope, North Carolina last August. “In four months, you could have 12-foot tall hemp plants on all of that land, and then have it again in four months,” instead of waiting years for trees to regrow, Perlowin said. 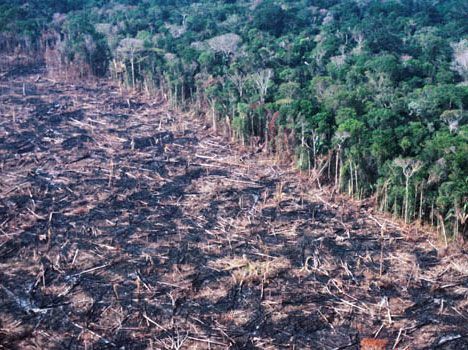 One shot of deforestation of the Amazon Rainforest in Brazil. Green Bay Packaging announced on June 12 that it will be constructing a new $500 million mill on its existing site over the next few years which is projected by company planners to double its production output and reduce a bulk of its environmental impacts, including the elimination of wastewater discharge into the Fox River. The project will be the first new paper mill built in the United States in over thirty years and represents one of the largest investments in the history of Brown County, whose Board of Supervisors quickly approved $5.3 million in financial assistance on Wednesday, June 20. Hemp fiber does not seem to be part of the company’s grand strategy, as it has long focused on recycled cardboard. 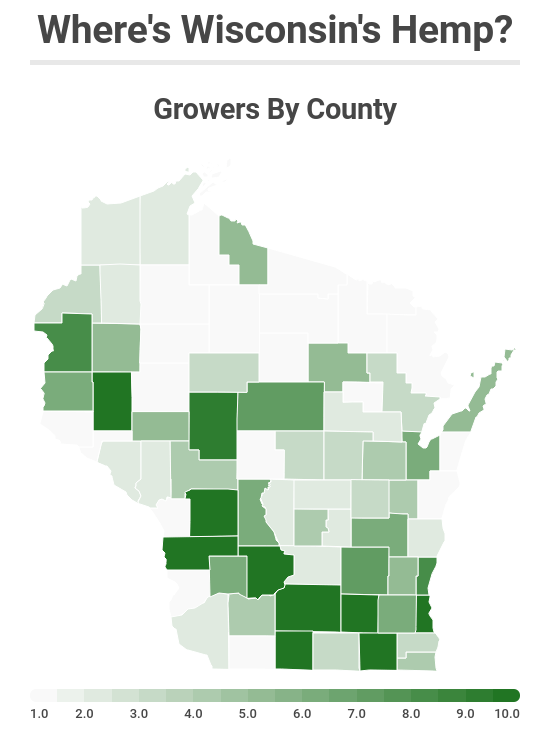 Six sites are being used for hemp cultivation in Brown County this year, though requests for acreage statistics were not immediately returned by the University of Wisconsin Extension Office.